We chose the IP350 because it had two full lazarettes, lots of intermediate level storage behind the salon seat backs, sugar scoop stern for easy access to/from the dinghy or when swimming, roller furling main sail and Hoyt boomed staysail for easy sail handling, one head with a short hose run to the holding tank, and a roomy aft cabin with a pullman berth that is great for two people. We bought the boat from Ed at Gratitude Yachting Center and put it in charter with them for several years. We wanted a new boat and wanted to equip her as we went along with those things that we felt were critical for livability. Working with Tom and the Maryland School of Sailing and Seamanship we managed to take the full suite of ASA sailing classes aboard our boat and equipped her for offshore use in the process. There were several upgrades that we felt were critical for anyone choosing to live on a boat for several months or years at a time. 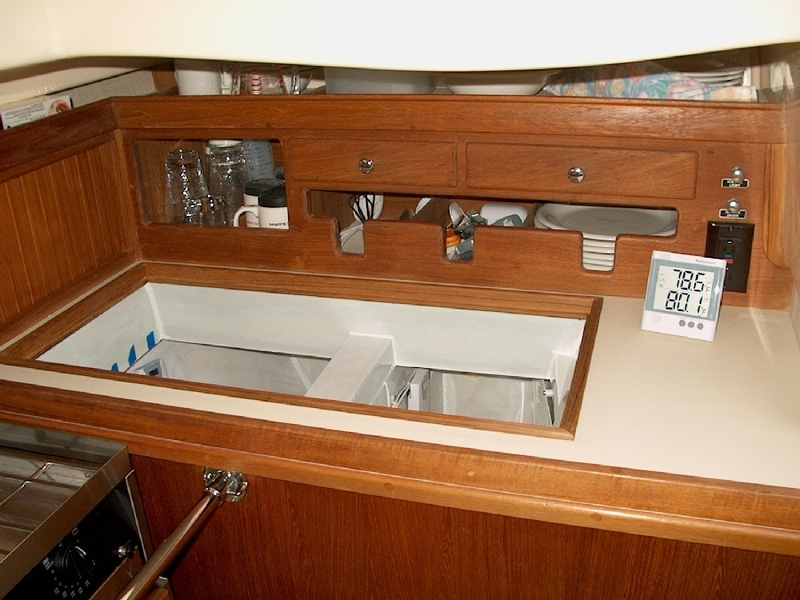 We found that the original large ice box was not adequate for extended cruising and was not well insulated. We added additional insulation, a combination of extruded foam and vacuum panels, and divided the space into a separate freezer and refrigerator. We opened up the top of the box so that we could more easily access either the freezer or refrigerator and built new doors with rear mounted hinges. The heart of the system was the Frigoboat K-50 keeled cooled compressor and new flat plate evaporator which I bent to fit the inside of the new freezer. The K-50, equipped with the Smart Speed Controller, is the most efficient boat refrigeration system available and with the keel cooled option there is no water pump or fan needed to cool the system condenser. I installed digital thermostats to control both the freezer and refrigerator spill over fan. 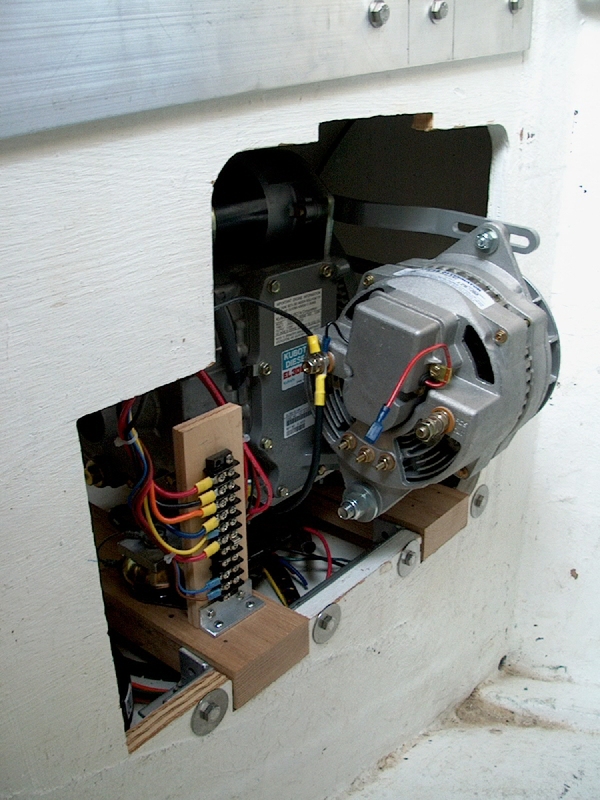 We added an Ample Power DC energy monitor, diesel powered 12volt DC generator set, and Smart Alternator Regulator. The Genset is based on a single cylinder Kubota engine and a large frame 225amp alternator. The engine is equipped with a remote monitoring panel that displays oil pressure and cooling water temperature. The engine is also equipped with automatic safety shutdowns for low oil pressure and high water temperature. We replaced the manually pumped marine head with a larger “home size” bowl and electric flush option. Having the larger size bowl/seat makes the boat head a lot more like home. 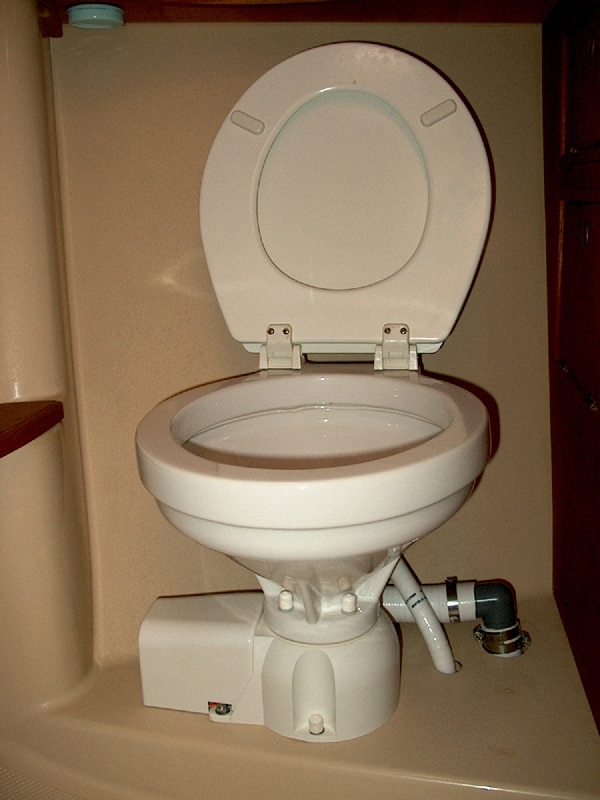 Coupled this new toilet to a Raritan LectraSan waste treatment system which means we can avoid using the holding tank in most places we travel. We originally installed a Village Marine Tec Little Wonder Modular 200 water maker but have since replaced most of that system with components from other manufacturers. We have no need to go ashore for water and use all we want, even washing the boat down after a passage. Our dinghy is an AB 10.6VL rigid inflatable with a Nissan 9.8HP two-stroke outboard. Having a good sturdy dinghy and a reliable easy to start outboard are critical to domestic tranquility. It is especially important that all crew can start and run the dinghy. Quick dry rides to/from shore make a lot of difference out here. For AC power aboard we use an 1800 watt inverter capable of powering any of our AC devices. To reduce battery consumption and generator load while heating water, we replaced the 1500 watt heater element with a 750 watt replacement. It takes about 35 minutes to heat up water so that we both can enjoy a warm shower. There were also upgrades that we felt were nice to have, improving long term livability on the boat. Most all of the upgrades that we made to the boat will be explained in more detail in the “Projects” section of this web site. We have extensive spares on board and a full suite of .pdf documentation for all systems and equipment. Lesley has done an outstanding job organizing all on board paperwork so that logs, recipes, provisions, inventories of everything are all kept in electronic format. Her cookbook, the best I’ve ever seen, is a collection of recipes that she has borrowed or developed over the years. I like everything in the cookbook and can prepare most any of the recipes. I like to cook but I really like to eat. Having a full freezer on the boat makes life in the culinary department so much more enjoyable. We are by no means roughing it on the boat and we are most definitely not camping.